‘Oh, I’m not religious’, is one of the first things people say to me when they know I’m a priest or chaplain. ‘That’s interesting’, seems the only reasonable response, which inevitably prompts a fascinating conversation about spirituality, the meaning of life and yes, even God, or more properly put, what on earth we mean by God. It seems that talking about God is a favourite topic, even for the non-religious, as long as we start at what the philosopher Alain de Botton calls the very, very beginning. A place where there are no deities, supernatural spirits or angels and move on from there. Religions are like a doorway into that which is more; the essential yet unknowable. Unfortunately, the doorway is where many people stop. Getting beyond the doorway is what religious practices and rituals are for, some of which de Botton identifies in his engaging TED talk, Atheism 2.0. He points to repetition, oratory, arranging time, bodies, art and travel as techniques religions use to draw people beyond the ordinary. Supernatural beings appear in works of art, nativity plays or religious festivals because they give us a way to imagine beyond our everyday world. Chants, Christmas carols and well-known prayers stick in the mind even if we don’t mean them to. Festivals like Christmas turn up year after year so that we can’t avoid bumping into them. Great cathedrals full of amazing artworks invite us to contemplate beauty and mystery. Even travelling the world with an interest in more than shopping can be seen as the ancient religious practice of pilgrimage to holy places. Perhaps being religious in the 21st century can be less about believing and more about using doorways to enter an exploration of life that opens us up to what lies under the surface. It’s a different way of seeing and valuing life, a perspective that is sometimes uncomfortable but unexpectedly fulfilling. To do this may change forever how we see the world and our place in it but as de Botton says at the end of his talk, ‘religions are so subtle, so intelligent in many ways that they’re not fit to be abandoned to the religious alone; they’re for all of us’. Amen to that! 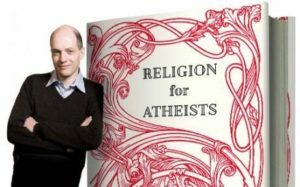 Check out Alain de Botton’s book Religion for Atheists. I read it when it was first published in 2012 and recently fell over it again. It’s still as fresh and intriguing as the first time around. You might also be interested in Alain’s brainchild The School of Life offering insights for everyday living. Their YouTube videos are worth browsing. May you continue to be inspired. I know how hard it is to keep going, sometimes in the face of the internal critic and all other kinds of interference but write from what rises within you. It’s authentic. Keep writing! And thank you for commenting. It really matters.